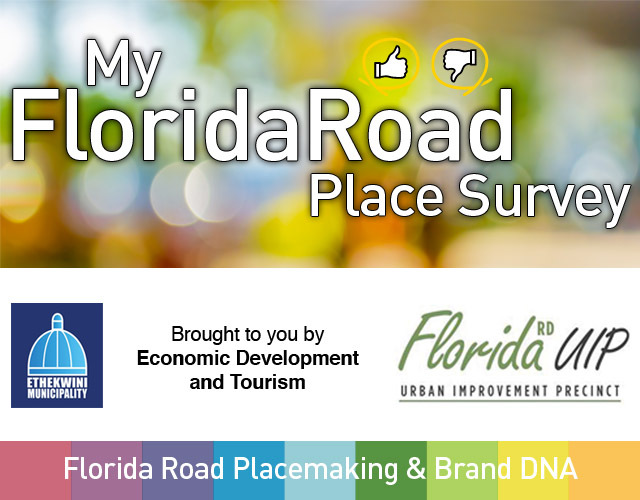 A critical component of the Florida Rd Place-making and Brand DNA process, a series of online surveys have been developed to gain maximum insight into visitor and local view-points in relation to Florida Rd’s place image, comfort and safety; accessibility and transport; culture and feel, and uses and activities. Surveys have been divided into the Local’s Survey for those who live, work, own property or manage an organization on Florida Rd. The Visitor’s Survey is for those who have visited in the past or are currently a visitor on Florida Rd, and the Hotel Visitor Survey is for those who have stayed as a tourist on Florida Rd. Those with an interest in the future of this key node in Durban are asked to take the time to fill the surveys in. Read more about the surveys and what they mean for Florida Rd.